I know my depression may kill me one day, but today is not that day. The truth is I’m not sure. Even before I could write, I made up stories to escape the trauma of my surroundings. Many of my earliest memories are violent and lonely. The rest are soft, sweet, and full of the joy of storytelling in the varied timbres of my brother, Mama, Grandma, and Grandpa seeping past and through our always-rocky financial situation and the great, gnarled yarn of mental illness among us. No one had to tell me we told ourselves stories in order to live. We all made something. Grandpa with his carvings. Grandma with her sewing, etc. I know one of the reasons I’m alive today is because I write. 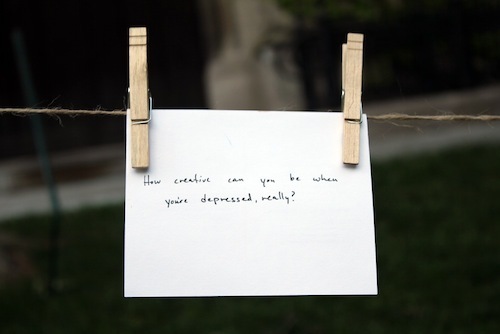 As an adult trying to eke out a career in a creative field, I’ve devoted a lot of time to reading about the link between creativity (writers in particular) and depression. When I learned of Ned Vizzini’s suicide last year, (author of: Teen Angst? Naaah…, Be More Chill, It’s Kind of a Funny Story, The Other Normals, and House of Secrets) I found myself crying for him and crying for myself. I did the same thing for Robin Williams. As I did for all three of my friends who killed themselves over the years. As I’ve done for the ones who overdosed. As I will do over and over. Sometimes, my outcome seems inevitable, but I write to combat that feeling. Like Dylan Thomas implores, I will rage against it. I urge other creatives out there (and everyone else fighting this terrible disease) to rage with me. Rage against it by making things. Do what you do and do it to survive. Rage against stigma. Rage against shame. Share. “One after another, my writer subjects came to my office and spent three or four hours pouring out their stories of their struggles with mood disorder –mostly depression, but occasionally, bipolar disorder. A full 80 percent of them had some kind of mood disturbance at some time in their lives, compared with just 30 percent of the control group…” (68). I am not the only creative in my family and brother, you have no idea how deep the mental illness and addiction goes in our clan. I come from a proper, southern, religious, sweep-that-mess-back-under-the-rug-where-it-belongs (try not to snicker at the contrast) family. Don’t dare talk about your problems. Poor Mama. She wound up with a writer and a musician for children. You may wonder what all this has to do with you and your writing or art (whatever form that takes), whether you struggle with depression or not. It has nothing and everything to do with your creative work. For some of us, it is survival. It’s about anchoring ourselves to the few things we can rely on when, for great swathes of our lives, we cannot rely on ourselves. My anchors are the act of writing, my husband, and my animals. “I’d argue that in 80 percent of all narratives, the young couple and their happiness are not the story; the story resides in the unhappy onlooker –Satan, watching Adam and Eve; Claggert, staring at Billy Budd; Iago, looking at Othello and Desdemona…” (208-9). What I find most interesting is how much Baxter’s essay reminds me of a discussion with my therapist about the meaning of the word “happiness” –its mythic, unattainable stature, and how what we should really strive for are moments of joy and self-care. I have major depression. It’s the one thing I write about that causes so much discomfort and unease. I lose more followers when I’m open about my depression than anything else I post about (even the constant stream of cat and dog photos). I struggled with whether or not to write about depression. I wanted to write something safer, but I chose the topic that made me most vulnerable. Most times if you are working hard to avoid writing something, that’s the very thing that begs to be written. Walk right into the dark, bubbling middle of that thing. Stare it in the eye. Writing without vulnerability is worthless. Today I anchor myself to you. Beth Gilstrap is the author of I Am Barbarella: Stories (2015) from Twelve Winters Press and No Man’s Wild Laura (2016) from Hyacinth Girl Press. She thinks she’s crazy lucky to work as Fiction Editor over at Little Fiction | Big Truths. Her work has been selected as Longform.org’s Fiction Pick of the Week, nominated for storySouth’s Million Writers Award, Best of the Net, and The Pushcart Prize.Her work has appeared in Re:AL, Queen Mob’s Teahouse, The Minnesota Review, Literary Orphans, and Little Patuxent Review, among others. Beth, this is beautiful. Poignant. I’m with you, Sister. Rage on and I’ll rage with you, and neither of us will go gentle. I have an inkling that many of these “romanticized” suicides simply were because not of an aforegoing illness (at least not “above average” but because it makes you lonely and depressive once you are rejected every so often and realize you are “ahead of your time” (sometimes by centuries). And, if you believe in an afterlife, as some of these creatives probably did, this is the fastest route to the next. As for “my depression may kill me one day” – I would want to suggest you go to youtube and search for “Faster EFT” (EFT = Emotional Freedom Technique – I can’t go into it in detail here, but it was adapted from an earlier technique by Craig and is based essentially on activating acupuncture or -pressure points, for which there is now an emerging body of scientific findings, so it’s a bit beyond “voodoo”).